DIN, three little letters with big implications, an acronym for safety when skiing. What’s your DIN? 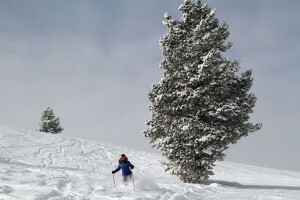 is a question oft heard on first tram at Snowbird or Jackson Hole. As if your binding setting determines your weightiness on the ski slopes. 9 or more is a source for bravado, like you are a bolder beefier skier than others set at a timid-sounding 2, 3, or 4. Growing up, my brothers loved the mantra, “when in doubt, don’t come out.” They also enjoyed making figure 11s top to bottom, “when in doubt straighten em out” …which is now referred to as straight-lining. Now that I’ve matured, I recognize my brothers’ practices were quite perilous. I’m more concerned about safety these days…in my 2nd half-century. Your height, weight, age and ski ability are all factors in a proper DIN setting. Age is perhaps the key fluctuating component for skiers that’s not always updated – properly calibrated among old-school skiers, who’ve always had a DIN of 8 for example, but at 55 or 60 should dial it back to a safer 6, say, to prevent injury. DIN calibrated standards change at 50, and so should your settings. Of course you should also be honest about your height, weight and ability (lol)… and adjust when any of these change. It’s a ski shop form, so it’s not like your weight gain or shrinkage is going on Facebook for all your ski buddies to see. I for one had a ski injury at 48, that could likely have been prevented if my ski binding had released. That sharp twisting turn should have caused my binding toe piece to release, but alas my marker bindings stayed on – tight, as they were adjusted to avoid a premature nuisance release. Lesson learned, I’ve loosen up. I recovered from that fractured tibial plateau, and now set my DIN per the appropriate age height and weight setting. Staying safe and alive at 5…. For the safest binding setting, your skis should be professionally checked annually, providing real “true” data of your actual weight (lol) height, age and ski ability, 1, 2, 3 and 3+. By the way, very few of us are 3+ ski level, that’s for extreme skiers. See our Gear Guide to the Top Skis! At Christmas time every skier I know has “snow” on the top of their wish list. The White Christmas is not so easy to deliver … its up to Santa and Mother Nature. Here are my favorite ski and snowboard gifts that you can easily give, from cheap to steep, for the ski friend that warrants a gesture – but not a new pair of goggles ($$$), to your sweetheart you want to woo and wax with serious swag so they are as excited to ski as you are. A Liftopia gift card. Liftopia sells discounted lift tickets at over 250 alpine resorts across North America, so giving the gift of this versatile vertical card is easy, for a downhill deal like $49 tickets to Sugarbush. You decide the amount, $5 to $1,000 denominations, and your friend can ski when and where they want – at serious savings. Heat Factory hand and toe warmers. These cheap pocket-size hand warmer packets are my personal life saver. Heat Factory or Grabbers chemical heat packets provide about seven hours of warmth, and extend your time on the slopes between lodge breaks for frozen fingers and toes. I have a pack a day habit – so I am always happy to give and receive (hint hint) hand warmers by the case. Give them to your ski buddy so they don’t bum yours all season. Alp N Rock makes gorgeous après ski shirts. I finally splurged forone myself – Merry Christmas to me, and I LOVE it. 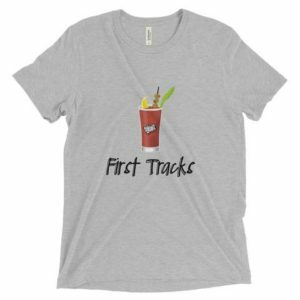 If you want your gal to embrace skiing, buy her a beautiful wool henley with alpine motifs and cool graphics from Stowe to Aspen to Zermatt – this stylish shirt goes from the slopes to the bars, anywhere you want to make a ski statement($160). Alp N Rock makes crew necks for dudes too, it’s like Affliction goes alpine. Ski socks. Ski instructors, pro skiers, and racers all agree – if your feet aren’t happy, you aren’t on top of your ski game. Ski socks make a huge difference in foot comfort, warmth, and wicking of funky foot sweat and odor. Ski socks cost $10-30, worth it for the technical fabric and fit. SmartWool Ski Socks and Vermont’s Darn Tough come in fun colors, shapes and sizes for skiers and snowboarders. New England Ski Museum, located at the base of Cannon Mountain, has great retro ski posters, videos, ski t-shirts and ties, games, and snowflake jewelry, for sale in their online store, from as little as $12. 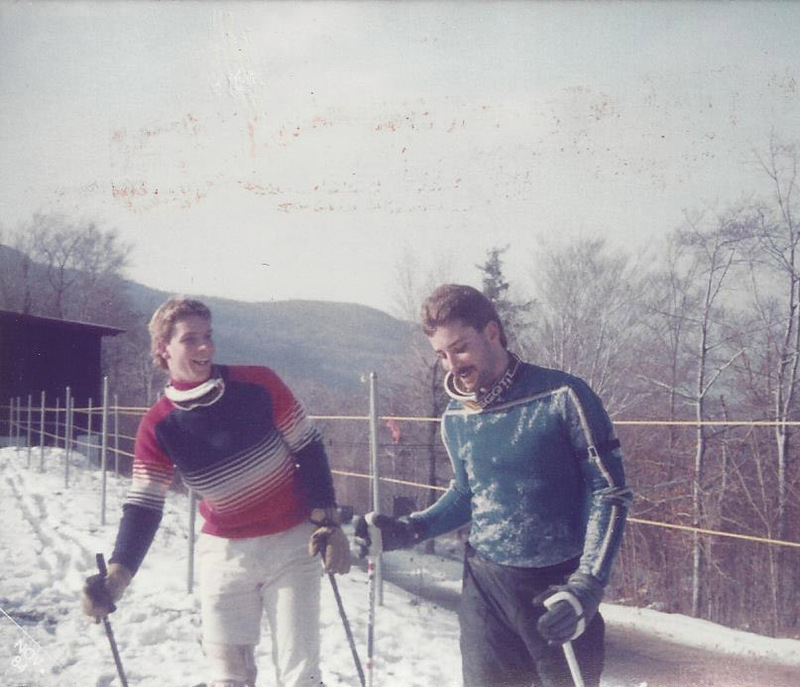 Best of all, your purchase benefits this non-profit ski association that is preserving ski history in New England. or week out west with this versatile backpack. 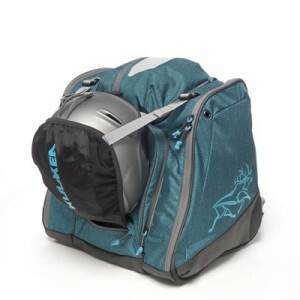 The Powder Trekker holds your ski boots in separate waterproof compartments, helmet, goggles, and gloves, with lots of smart pockets for your pass, sunglasses, and a surprisingly roomy center compartment for base layers. Kulkea’s boot bag is super lightweight, made of performance fabric, looks moderately stylish (for a backpack), and keeps you organized on a powder morning. Kulkea means “to go” in Finnish, and this will be your go to ski boot bag. Happy Holiday and I hope your Christmas is white with snow! Our top ski and snowboard gifts, from cheap to steep, for friends, family, kids, and après ski fans who never plan to hit the slopes but want look the part for the party! How cool – literally – is the Lego Ski Resort Kit? I love Legos, my son did too – and he went on to study engineering. Let your kids be creative this Christmas – and all season long, use their imagination and build their own snow resort. I can picture kids in their cuddly long undies on the floor by the fireplace playing with these ski themed Lego for hours, après ski! Check out the adorable ski chalet kit with multi-racial skiers, a snowmobile, fireplace, hot tub, and a husky – of course! Ok, I wish I was a kid, let go of my Lego! Heat Factory hand and toe warmers are a cheap but cozy thoughtful gift. These pocket-size hand warmer packets are my personal life saver. Heat Factory or Grabbers chemical heat packets provide about seven hours of warmth, and extend your time on the slopes between lodge breaks for frozen fingers and toes. I have a pack a day habit – so I am always happy to give and receive (hint hint) hand warmers by the case. Give them to your ski buddy so they don’t bum yours all season. Ski socks… Ski instructors, pro skiers, and racers all agree – if your feet aren’t happy, you aren’t on top of your ski game. Ski socks are your base and the basics to comfort and performance. Quality merino wool ski socks provide foot warmth, and wicking of funky foot sweat and odor. Ski socks cost $10-30, worth it for the technical fabric and fit. SmartWool and Vermont’s Darn Tough come in fun colors, shapes and sizes for skiers and snowboarders. The Best Ski Boot Bag is by Kulkea. For $120 you can pack for a day, weekend or week out west with the versatile Powder Trekker backpack. They also have a heated Thermal Trekker boot pack ($229)! How sweet is that – you can warm your ski boots, and your breakfast croissant on the way to the ski slopes. Kulkea boot bags are compartmentalized to hold your ski boots in separate waterproof sleeves, helmet, goggles, and gloves, with lots of smart pockets for your pass, sunglasses, and a surprisingly roomy center compartment for base layers. Kulkea’s boot bag is super lightweight, made of performance fabric, looks moderately stylish (for a backpack), and keeps you organized on a powder morning. Kulkea means “to go” in Finnish, and this will be your go to ski boot bag. We also love that the Kulkea brain children are East Coast skiers. J Skis are the ski to be on. Designed by Jason Levinthal, creator of Line and Full Tilt, these J Skis are his latest baby, 6 unique designs with a variety of custom graphics J’s. We love the construction and creativity behind the Vacation Skis – complete with cute babes on the top sheet. The Hot Dogger comes topped with condiments – smear of mustard please. For gals who rip, the unicorn inspired pink Whippit looks wicked fun. These high quality, head-turning skis are hand made with carbon fiber and maple core (made in Quebec Canada eh?!). J Skis are sold direct with 100 % guarantee from Jason himself – so you save on “retail markup” and your skis are autographed by the man, the legend since 1995. A Liftopia gift card. Liftopia sells discounted lift tickets at over 250 alpine resorts across North America, so giving the gift of this versatile vertical card is easy, for a downhill deal like $49 tickets to Sugarbush. You decide the amount, $25 to $1,000 denominations, and your friend can ski when and where they want – at serious savings. Ski Keepsakes For great retro ski posters, pillows, mugs, ski t-shirts, games, and snowflake jewelry, The New England Ski Museum has a great location, at the base of Cannon Mountain, and an online store, with unique ski gifts for as little as $12. 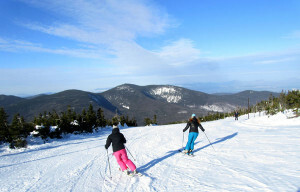 Best of all, your purchase benefits this non-profit ski association that is preserving ski history in New England. 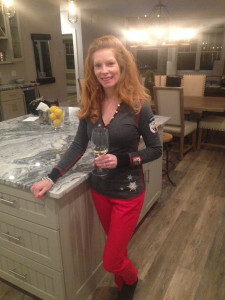 Alp N Rock makes gorgeous après ski shirts. I splurged for my #selfie – Merry Christmas to me, and I LOVE it. If you want your gal to embrace skiing, buy her a beautiful wool henley with alpine motifs and cool graphics from Stowe to Aspen to Zermatt – this stylish shirt goes from the slopes to the après ski bars, anywhere you want to make a ski statement ($160). Did I mention its warm, with soft merino wool, no itch?! Alp N Rock makes crew necks for dudes too, it’s like Affliction goes alpine. 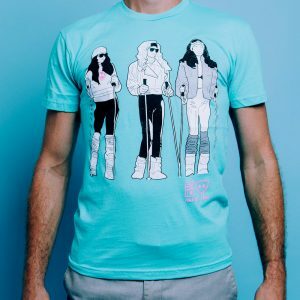 We love All About Après ski swag, from caps, to T-shirts, hoodies and hats, this wearable-art ski gift will be the talk of après ski – especially the lovable St Bernard Ski Shirt. Also we love the First Tracks Bloody Mary T, perfect for those pretty gals that dress Sunday morning to ride the lift to the on mountain bar for their booze infused lycopene cocktail! 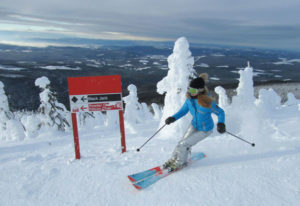 Or give them snow, take your family to a New England ski resort – they have been blowing snow whenever it’s below, and it’s surprisingly white on the slopes due to the extensive, expensive snowmaking the ski areas have been putting out. We love snow, and Jon Snow, so pardon our Game of Thrones puns about “Winter is coming”, “Winter is here”. 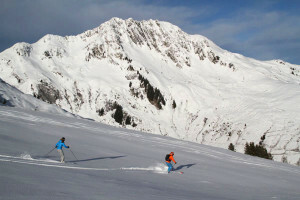 It just seems an approprite way to tweet out our alpine enthusiasm for ski season ! 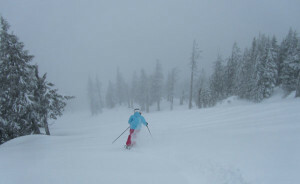 Its cold, its snowing, ski resorts are opening! Good news, avid skiers are already on the slopes in Colorado, Canada and Vermont, and the long wait for winter is over for summer loathers! Arapahoe Basin opened for skiing October 13, 2017, with Loveland opening a week later Oct 20, in Colorado. In the East, The Beast of the East – Killington – opened Nov 8, 2017 for passholders only, a tradition the Big K started a few years agao to reward loyalty. 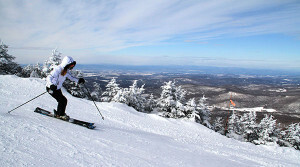 The public is welcome to ski Killington the following day Nov 9. 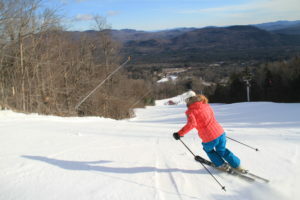 Also in Vermont, Okemo Mountain Resort opens for skiing Saturday Nov 11, as does Maine’s Sunday River – a perennial early season fave for first tracks. 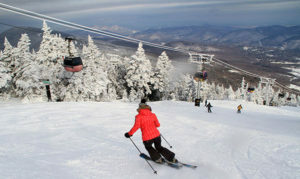 Killington has some serious snow making to do in order to host their second consecutive World Cup ski race Thanksgiving weekend, they are busy burying the Superstar trail in deep man-made snow for the Women’s World Cup competition that drew big crowds last November, despite balmy temps. In Canada, Banff Norquay was the first ski are to open, with Lake Louise soon following suit. In Europe, The Alps have had early season snow, with Solden, Obergurgl Hochgurgl, and Hintertux Glacier in Austria all open for skiing. 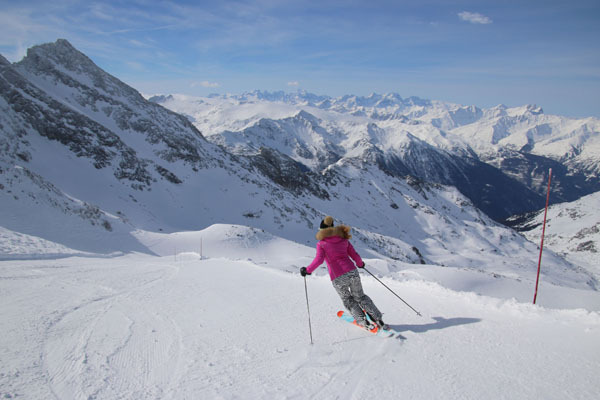 In Switzerland, Zermatt and Saas Fee are open for limited early season skiing. Tignes France is also open for glacier skiing. 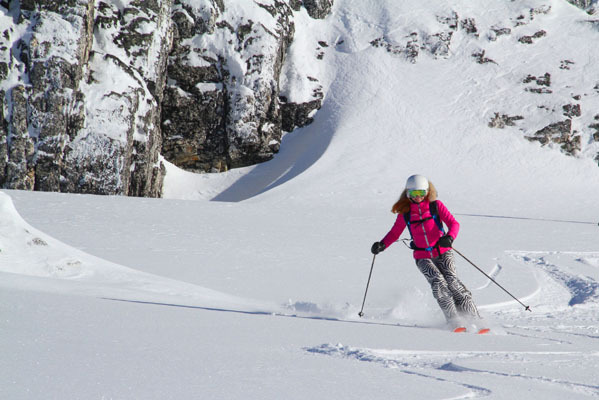 So get ready, get fit, get your ski gear out of storage – ski season is here. We will be at the Boston.com Ski and Snwobarod Expo Nov 9-10 to see the latest ski line up, ski resort ticket deals and ski travel plans, and to check out ski fashions at the Vertical Runway Ski Fashion Spectacular featuring DARE2B, ELAN, ATHALON, SPYDER, SCOTT, SKEA and KARBON. Ok, we’re biased because ski fashion is our passion, this show is sponsored by Sunday River and produced by our ski fried and fashion stylist Kathy Benharris. See you on snow soon! Stay in ski shape all summer! 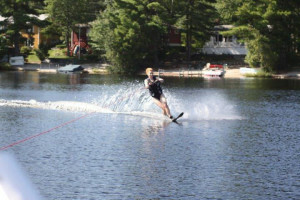 H2O Skiing – water skiing is a second cousins to snow skiing. 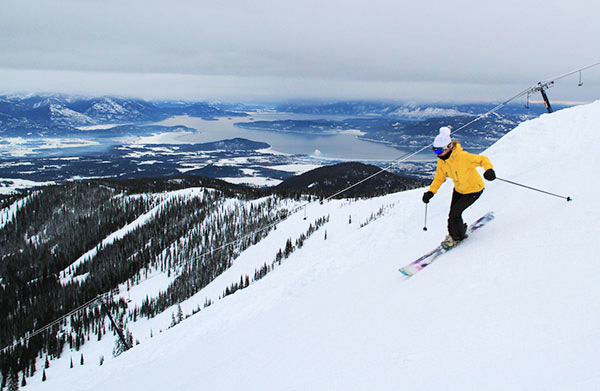 The quad muscles, core strength and isometric movement is the same skiing on water as on snow. Water skiing is a great work out, explosive energy and fitness is required to get up and stay up for a 15-30 minute ski, as much as 13-15 ski runs in fact Like downhill skiing, it’s not for the timid or the faint of wallet – let’s see you need a ski, or two, a ski boat, pfd, tow line, gas for the boat, a driver and spotter, and then you pray for calm crystal waters, glass-like lake conditions are akin to powder or perfectly groomed snow. 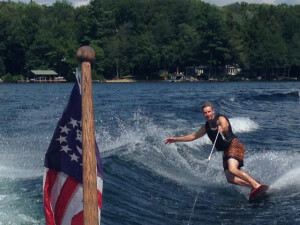 The speed and centrifugal force of an arcing water ski turn is as close as you are going to get to the thrill and gravitational pull of carving on snow till winter returns. Wakeboarding – the summer bro to snowboarding, wakeboarding also works your quads, core and upper body in great pre-ski or après ski season conditioning. If you like to hit the terrain park in winter on your board, then wakeboarding is just your speed in summer sine you can perform tricks, turns and jumps on a wakeboard. Cycling – road cycling or mountain biking are great exercise for skiers and riders. You work your quads, gluteus, hamstrings, and calves while exploring the great outdoors. Whether you are big on hill climbs or prefer touring the meandering coast on your road bike, cycling is a fun fitness activity. Like skiing, heads up and helmets on – bike accidents are more prevalent than ski injuries, and particularly bike head trauma. So ride with care, watch for cars, and seek out bike paths, trails and quieter less trafficked places to ride whenever possible. Hiking – what better way to enjoy the beautiful mountains in summer, without snow, than to climb to the summit. Pack a picnic, put on your hiking boots and go for the peak. Hiking is easy on the wallet and the eyes, especially when you summit and can see the panorama you earned from your ascent. Just like skiing, your hiking regimen should start small and gradually increase your distance and mountain difficulty for the best enjoyment and conditioning. Be prepared for all weather and conditions, do your research, and pack in and pack out all your provisions (water, food, flashlight, first aid). Take only memories and leave only foot prints is the golden rule among hikers. Take care on your descent to use proper form for those ski knees of yours. Consult your local state parks and hiking clubs for tips on the best trails, where to park and start your trip, and to find the right hike size, length and steepness s for your level and time allowance. 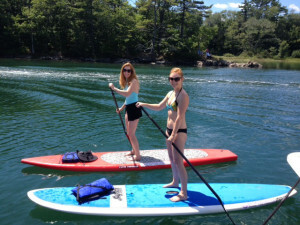 Boating – SUP – sailing or power boating, stand up paddle boarding, kayaking or canoeing, while not as physically strenuous as skiing, offers a similar great outdoors escape as snow sports. Being on a boat provides a feeling of oneness with nature, and the opportunity to escape from the concrete jungle, the computer keyboard, the day to day, and test your survival skills with outdoor adventure. Many skiers spend their summers boating for the beauty of being on the water, not unlike being on a mountain. Boating is also very social, like minded individuals gravitate toward the water – which is melted snow after all, to party, swim, raft and tell fish tales and yachting stories in lieu of powder day brags. These are a few of my favorite summer things… what’s your summer savior till snow flies and we ski again? Heather Burke has been the editor of Family Ski Trips since 1995. In 1999 she launched Luxury Ski Trips- which she later sold to SnowPak.com, and she launched Luxury Vacation Guide in 2017. What’s your ski goal each season? 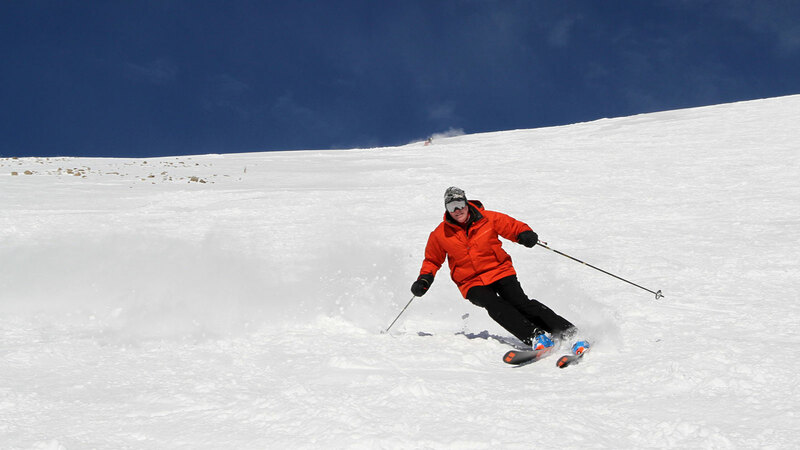 Ski my age in days – so that’s 50 this season… and an exponentially more challenging goal to achieve each year! 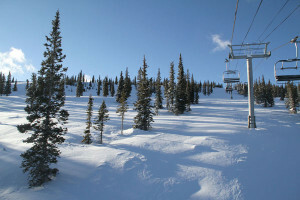 Also I want to add several new ski resorts every winter, I’ve skied 147 on Liftopia’s Where I’ve Ski app! What’s your Favorite Ski Resort? The one I haven’t skied yet! #lol Seriously I love Kitzbuhel and St Anton in Austria, and Big Sky in Montana, and there are very few ski areas I don’t love (not naming names). Where do you most want to ski? 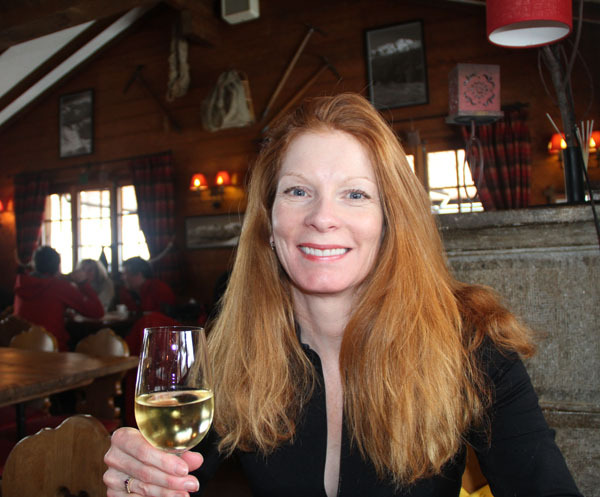 As a travel journalist, I am fortunate enough to to ski all over the globe… I’m living the dream. I’m very excited to ski and aprés ski the French Alps this season! 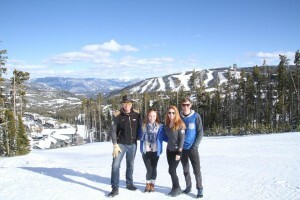 just skied Big White in BC Canada – it made my Canadian Top 10 Ski Resorts! Favorite Gear? Right now its my Rossignol Temptation 100’s! It’s the first time I have found a women’s ski to be a real strong performer and an all quiver ski. These Rossi’s are wide and stable, carve well on groomed and hard pack but float beautifully in powder – and they’re pretty! Go To Ski Outfit? 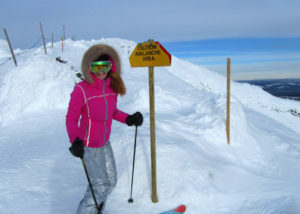 I love my SKEA Silver Cargo Pants, my Skea Blue Effie jacket with the gorgeous fur trim hood, and my aprés ski skirt! Proudest skiing accomplishments? Raising two beautiful children who love to ski as much as me, skiing 170 ski resorts (so far, so good!) and being a respected ski travel journalist! What famous skier would you most like to meet? Lindsey Vonn – Strong is the New Beautiful! And Klaus Obermeyer – he’s amazingly passionate, talented and time-tested. 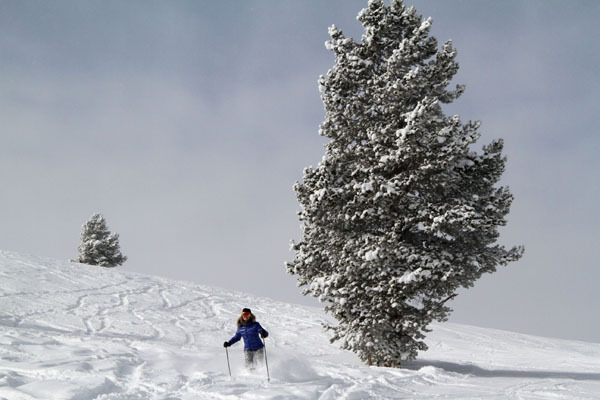 Leave it to Vail Resort to generate the most engaging mobile ski app – Epic Mix. From the folks who bought you the Epic Pass – a super savings season pass good at all Vail’s resorts, here is an Epic Mix app that tracks your vertical skiing, gives you real time intel on ski conditions, lift line times throughout Vail Resort, shows how your kids are progressing in ski school, and how your race time is compared to Lindsey Vonn. Epic Mix even offers up photos of you and your friends that were captured around the mountain, thanks to your scan-able RFID lift access card. 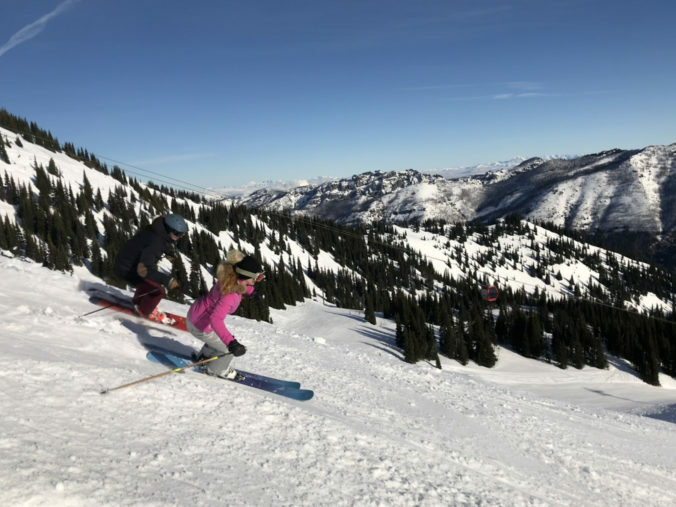 Here’s my honest scoop on the EpicMix ski app, I’m not big on apps or skiing glued to my phone… I go to the mountains to escape https://familyskitrips.com/family-ski-vacations/wp-admin/edit.phptechnology, electronics, stats and media. What I like about Epic mix is you don’t even need your phone app turned on. Just sign up, turn off your phone and go ski if that’s the way you want to play. You can check your skiing stats online or on your phone at the end of the ski day. Other ski apps- Trace and Navtronics Ski apps munch data and run down your battery. Epic Mix tracks via your ski ticket, so you can turn it on to check your stats at the end of the day or the season, even view the app on your pc, so you’re not staring at your smart phone all day and missing out on Vail’s epic scenery. Of course the new Gondola One has Wi-Fi and heated seats, a Vail’s 50th anniversary lift, if you want to check on your vert accumulated mid-day, see the line wait times at Lions Head, or reserves a lunch table with a view at the 10th Mountain Lodge at mid Vail. The only thing better than the free Epic Mix app is Vail’s Epic Pass, which for $599 with an early season purchase (read: April for the next season) includes skiing at all 18 of Vail Resorts. 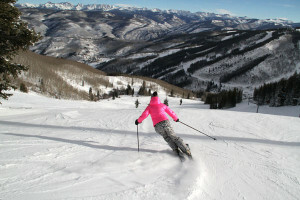 Figure that a day ticket at Vail is $179, Beaver Creek is $180– so this pass amortizes quickly with one trip out west. The Epic Mix app will track your vertical at all them, Vail, Beaver Creek, Breckenridge, Keystone, Park City/Canyons, Heavenly, Northstar, and Kirkwood, Whistler Blackcomb, Stowe, Okemo and Mount Sunapee. The PSIA and I agree on how to get your kids ready to ski. Here is sage ski advice from the Professional Ski and Snowboard Instructors of America with our own Family Ski Tips. Confession: I was a member of PSIA when I taught skiing at Smugglers Notch Resort in Vermont in the 90s. Flash forward, as Editor of Luxury Vacation Guide and FamilySkiTrips.com, I have similar ski tips for parents on how to make skiing fun with less stress for everyone. Skiing and snowboarding require physical fitness, so start an exercise program for you and your family. Whether it’s enrolling kids in soccer or another sport, to taking walks together as a family, it’s important to get moving. See my similar tips on quad strengthening wall sits pre ski season. 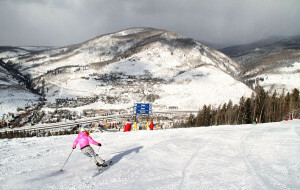 Ski resorts have mountain cams, temperature updates, even meteorologists on retainer. Know before you go – what the weather and temperature is like on the mountain and where you are staying, so you can dress your child appropriately for conditions. At some resorts temps vary greatly from the town versus the mountain, mind the elevation too! For younger children getting used to putting on ski or snowboard equipment and clothing helps them adjust to the mountain environment more easily. You can make it a game, we call it the pre ski season fashion runway show, and help them see their ski/snowboard clothes and equipment as something fun to play in versus something strange or bulky to wear. For older kids, it also helps to check to make sure everything still fits and is working properly before you arrive on the slopes. Having your kids learn from an expert can make their ski/snowboard experience more fun, see our Top Tips for teaching kids to ski, and also gives you time to enjoy the slopes. Set the expectation that the lesson is more like a sports practice than going to school and that they’ll have fun while getting to learn new skills. 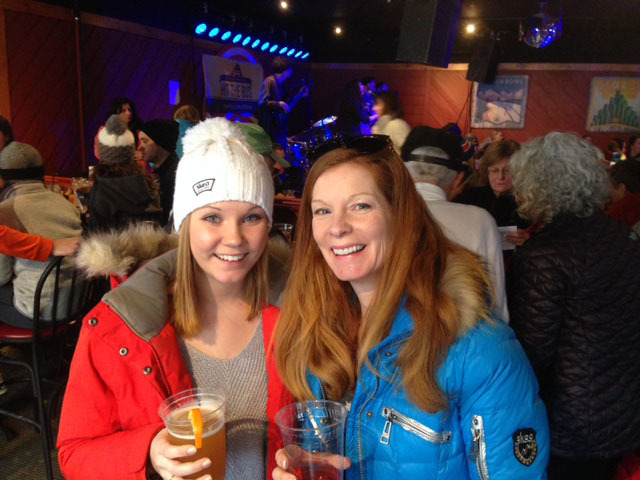 We couldn’t agree more – nothing like a Warren Miller family ski movie night to amp up the alpine enthusiasm among the fam! 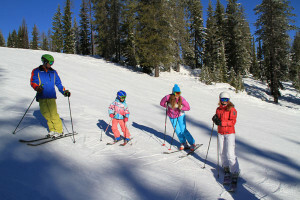 Use media to motivate your kids and set expectations of what their experience on the mountain and lessons will be like. Check out ski and snowboard clips on YouTube . You don’t have to spend a fortune on kids’ ski and snowboard gear. Just make sure they have a good snowsuit that’s wind/snow resistant along with goggles, long socks pulled up below the knee, snow gloves and insulated layers. If they become more involved in the sport then you can invest in wicking base layers and more expensive jackets when they will be out on the mountain for longer periods of time. 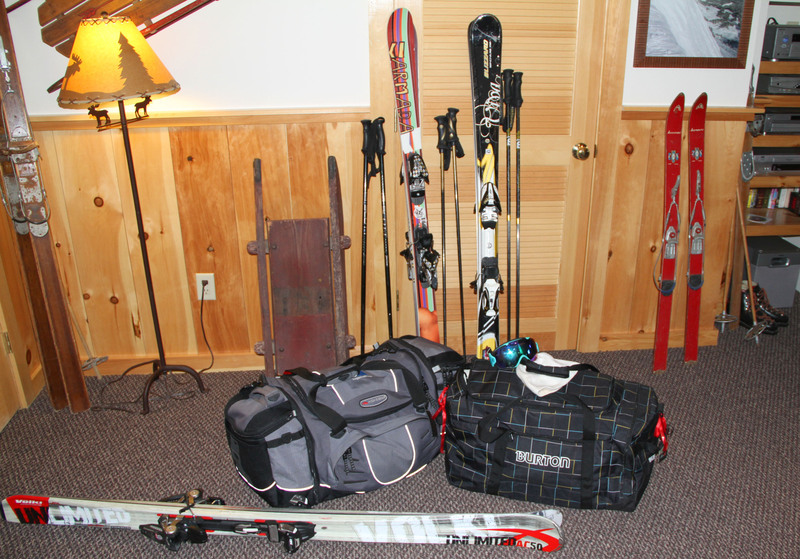 There’s a science to packing properly – see our guide to packing for a family ski trip. 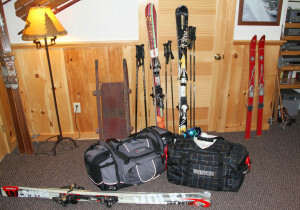 Get your kids ski bags and gear and get ready! See our reviews of the Best Family Ski resorts in the World and we’ll see you on the ski slopes! I love getting new skis, I’m like a kid in a candy store when I get to demo shiny sharp new boards. But I hate having to buy new ski boots. Achieving a perfect ski boot fit is so key, yet so taxing on my soles. Fellow skiers, you know the pinches and winces associated in breaking in new ski boots, or more likely – new ski boots break you in – from your toes to your shins. So when my four-season-old ski boots were feeling cavernous, the lining packed out, the insoles lacking any cushion or bounce, just a bad odor, I dreaded shopping for new ski boots. Not having time, or an extra $500 kicking around, I opted instead to spend just 15% of that on new custom foot beds with admittedly low expectations. Wow – what a difference. My 160-ski-day-old boots were revitalized. By simply sliding in new Tread Lab foot beds, my feet and my skiing were reinvigorated – not to mention fresher smelling. 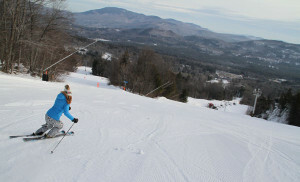 I could carve better, and my feet were warmer – even on a -4F degree ski day at Sugarbush, Vermont. I didn’t even have to schlep to the ski shop since Tread Labs, based in Stoneham, Mass., ships two pair of insoles within your exact shoe size and width, offering varying arch support. You pick the best fit and send the other pair back in the prepaid, labeled package. If neither pair of insoles work, return them both for a full refund. There are plenty of custom foot beds and orthotics on the market. Tread Labs, made in the U.S., have a unique deep heel cup and indestructible arch support – with a lifetime guarantee. I’ll get back to you on that after 40 days of skiing. Apparently you can also move your Tread Labs to other footwear, your sneakers in summer and hiking boots in fall for example. At $75 a pair, Tread Labs are worth trying to enhance your ski boot comfort and therefore your skiing performance, because happy feet are key to a happy skier.